Cycles are part of nature, human life, and the social fabric of our country. Just as the four seasons progress sequentially through the year, so is there a rhythmic cadence to periods of social change in America. Each generation has a unique role in shaping these periods and triggering the shift to the next. This generational cycle has four periods, lasting a total of about seventy to eighty years. This book chronicles changes in the social, political and foreign affairs of the United States since 1945 and the cyclical forces which drove them. Trust in government has steadily eroded while other measures of social order have also fluctuated. Important events like the McCarthy hearings, Vietnam, the Reagan era, the Iraq war, and the Trump presidency will be examined through the prism of the ‘season’ they occurred in. America has been immersed in a ‘Crisis’ period since September 11, 2001. Our social, political and foreign policy perspectives have witnessed seismic shifts. Since then, multiple traumas have united us while political polarization has divided us. “Heroes’ have taken on wide-spread importance. But this ‘Crisis’ period will end soon and we will enter a new American ‘High’ period, reminiscent of the period from just after WWII until the Kennedy assassination, but imbued with all the progress and changes since then. Gen X, Millennials, and an emerging Gen Z will drive this new era forward, with their unique persona and role to play. Baby Boomers will recede from prominence, having made their contribution to social and political change in America. This new ‘High’ period will be a time of greater optimism, cooperation, and community. 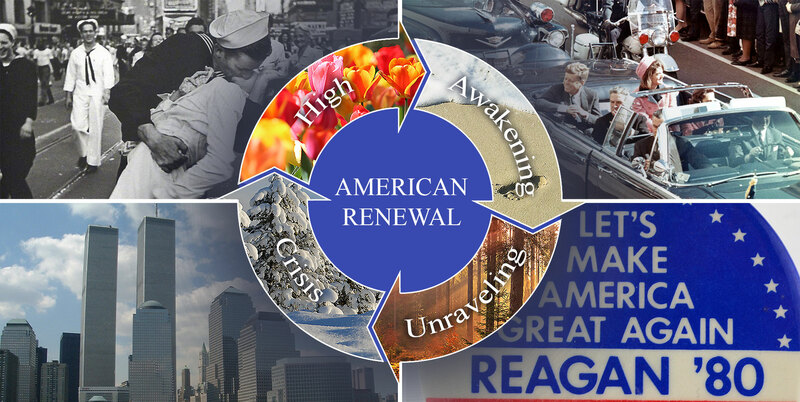 In American Renewal, O’Malley adeptly brings his original voice, fluid style and vivid illustrations to the interpretation of social and political change since 1945. 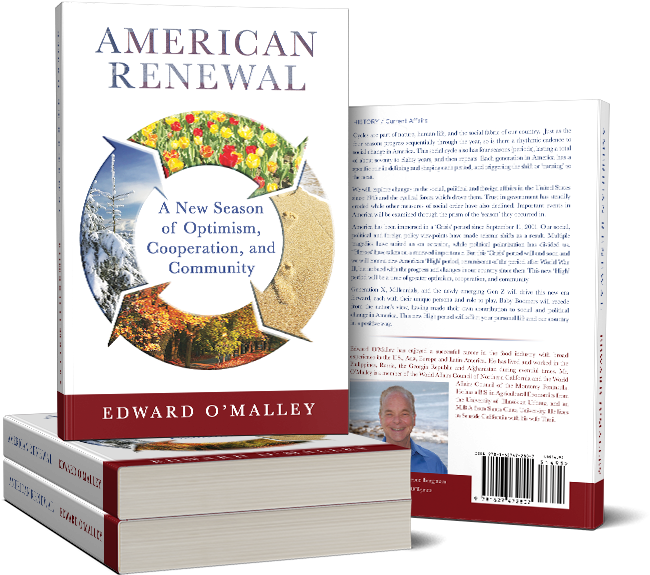 Edward O’Malley makes a valuable contribution to the on-going study of American generations and the cycles of history. co-author of national bestseller The Fourth Turning and Generations. EDWARD O’MALLEY has lived and worked in the Philippines, Russia, the Georgia Republic and Afghanistan during eventful times and has done business in over twenty other countries. O’Malley is a member of the World Affairs Council of Northern California and the World Affairs Council of the Monterey Peninsula. He has a B.S. in Agricultural Economics from the University of Illinois at Urbana and an M.B.A from Santa Clara University. He lives in Seaside California with his wife Timi.